This article looks at the safety aspects of different types of welding processes and assesses precautions to be taken. Welding necessitates careful risk assessment and the provision of good procedures, but it is not difficult to provide protection for welders that makes the job no more hazardous than any other workshop practice. Arc welding techniques are still the most common. The process may be manual metallic arc (MMA), metal inert or active gas (MIG or MAG), submerged arc (SAW), tungsten inert gas (TIG) or plasma, to name only the more common ones. All require electricity to create the arc and a molten weld pool is formed that joins the two pieces of metal. Arcs generate, to a greater or lesser degree, radiation spanning ultraviolet to infrared and metal evaporation that condenses to fume. Each of these aspects has implication on the health and safety of the welder. Gas welding is rarely used in production now, but oxy-fuel gas processes are still prevalent for cutting. These rely on melting and expelling metal from the plate so protection is required both to observe progress and to avoid being burnt by flying metallic particles. Resistance welding looks a relatively innocuous process as the molten metal is contained within sheets of solid material, but metal ejection can occur and injure an unwary operator. There is increasing application of lasers in welding. These are necessarily high power and capable of inflicting serious injury at a significant distance if wrongly directed. Electron beams used for welding are usually contained within a vacuum chamber, but an out-of-chamber variant is being developed that will need at least the same precautions as laser welding. Friction welding, especially friction stir, also plays a significant part in the modern fabrication shop. This, and other solid state processes, avoid the radiation problems of arc welding, but introduce the risk of entanglement in rotating parts if not adequately guarded. A specific process, aluminothermic welding, is used for joining rail track. This relies on the highly exothermic reaction when aluminium and iron oxide are ignited to create molten metal that is cast into the joint gap. The risks here are similar to casting in a foundry, misdirection of superheated molten metal having the gravest consequences. Welding is not confined to metals; these days plastics are welded by hot gas, electrically heated plates, vibration and a host of other techniques. Plastics melt at lower temperatures than are common with metals but they still present burn hazards. Fabrics and composites are also welded. Welding introduces hazards but does not need to be dangerous. 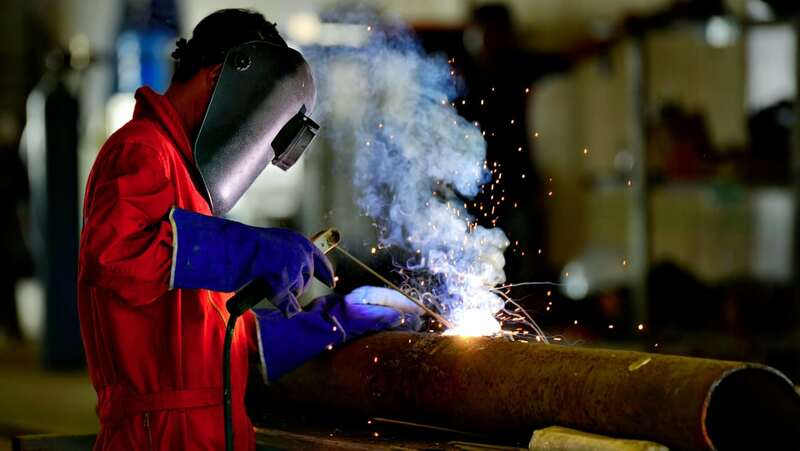 In the following sections, we look at each of the hazards associated with welding and its ancillary operations, comment on the level of risk for the various processes and materials and identify the precautions and PPE required for safe operation. Welding is usually only one of a number of processes required to fabricate or manufacture something. Several of these processes can generate significant noise hazards. Sheet metal work usually requires guillotining and hammering or pressing to form components. Thicker metal is often ground to prepare an edge for welding. During MMA welding, slag can be removed with chipping hammers or grinders. Air-arc gouging or pneumatic burr grinding may be used to remove incorrectly deposited weld metal. All of these processes create noise at a potentially damaging level. The Control of Noise at Work Regulations 2005 define a lower exposure action value as a daily or weekly personal noise exposure of 80 dB (A-weighted, i.e. with frequency response simulating the human ear); an upper exposure action value as a daily or weekly personal noise exposure of 85 dB (A-weighted); an exposure limit value of a daily or weekly personal noise exposure of 87 dB (A-weighted); and an absolute peak noise level of 140dB. It should be remembered that an increase of 3dB is equivalent to doubling the noise. No employee shall be exposed to noise levels above the peak level or consistently above the limit of 87dB, though these levels take into account the effect of wearing hearing protection. With a noise level above the lower action limit, hearing protection should be available on request to employees. In conditions above the upper level of 85dB, the employer must make hearing protection available and ensure that it is worn. Also, the employee is obliged to make use of such PPE provided. Guillotining and hammering can easily achieve 95 to 100dB, grinding may reach 105dB and air carbon arc gouging creates noise levels in excess of 110dB. Some welding processes are noisy in their own right - MIG may emit noise at around 90dB; friction welding of steel and vibration welding of hard plastics can also emit high levels. To comply with the Regulations, an employer has to conduct a risk assessment of the noise in the working environment and do all that is possible to reduce the level so far as is reasonably practicable. Where the upper action level is exceeded, the employer must designate the area as a hearing protection zone using appropriate signage and ensure that employees and others entering it wear hearing protection. BS EN 352/1 to 3 defines the hearing protection equipment to be used. Furthermore, health surveillance records that include hearing tests must be kept and be made available to employees on request. The most intense radiation occurs in laser or electron beam welding. These beams are of sufficient power to vaporise metals they impinge upon. Clearly, if allowed to contact a human body, they would do severe harm. The most logical method of protection is to isolate the operator and other staff from the beam by containment. Most electron beam guns operate in high or partial vacuum so are wholly within a chamber. Moreover, the equipment generating the beam is substantial and fixed so the direction is always towards the work piece. Lasers can be transmitted via long glass fibres and there is more likelihood of inadvertent positioning of the exit from the fibre. However, the laser needs focussing to create full power and the welding head that achieves this is held by a robot. Normal workshop practice with robots is to govern the machine by interlocks such that no operation can occur until all personnel are outside of an enclosure and safety switches set. Solid wall cells with interlocks on the doors are an excellent means of separating the operator from the machine. Arcs emit radiation omni-directionally. All emit ultraviolet light to a greater or lesser extent; in MIG welding of aluminium the emission is intense. The unprotected eye can be seriously harmed by ultraviolet light from any arc process. Arc eye or welders’ flash, an immensely uncomfortable irritation of the eye, may result from even short duration flash exposure to a welding arc. Arc eye is caused by inflammation the action of UV radiation on the outer surface of the eyeball; long exposure could cause permanent damage. Ultraviolet radiation also affects skin causing severe burning. Long-term exposure of the skin to UV can induce skin cancers though there is no evidence that welders are more prone than others to melanoma. Visible light is also very strong in a welding arc. In principle this could adversely affect the retina of the eye but the human reaction is to close the eyes when submitted to intense visible light so in practice this is not an issue. Infrared radiation is felt as heat. Welding arcs, particularly those at higher currents, will quickly burn exposed skin. The long-term effect of IR on the eye is to increase the opacity of the lens (i.e. to form cataracts) but, again, there is no evidence that welders are more prone to this than the general population. Radiation, both UV and IR, from arc welding is so pronounced that welders must use filtering to complete the task and this may ensure that they do not receive long-term exposure. Submerged arc welding, where the arc between a continuous wire electrode and the work piece is completely covered by a bed of granulated flux which protects the arc zone, is one arc process that does not emit radiation to a harmful level. Considerable heat may be given off, but eye and skin protection can be similar to that for general workshop practice. PPE to guard the skin against welding radiation is given in BS EN 470-1:1995 ‘Protective clothing for use in welding and allied processes’. Welders should ensure that their heads are protected by a hood. It is easy to forget that UV will penetrate even a good head of hair and cause burning of the scalp; many welders are, of course, without even that covering! Eye protection is covered by BS EN 169:2002 ‘Personal eye protection. Filters for welding and related techniques’. This has an informative Annex A ‘Guidelines on selection and use’ that shows recommendations for filter grades for the various welding processes. A modern approach to filters for eye protection is to use auto-darkening lenses. Helmets with such lenses have a detector that darkens the lens to a specific grade within milliseconds of being stimulated by the presence of an arc. These are also covered by a standard, BS EN 379:2003. Work areas where welding is taking place should be screened from the surrounds by transparent tinted plastic curtains. These are defined in BS EN 1598:1998. High currents in arc welding can give rise to magnetic fields larger than those experienced in other workplaces. Operators should avoid wrapping cables around themselves in order to prevent unnecessary exposure to magnetic fields, and also to avoid being pulled off balance. Heart pacemakers may be affected by large electromagnetic fields, though the effect depends on the type of pacemaker and the medical condition it is controlling. An operator fitted with a pacemaker should discuss its use in magnetic fields with a doctor before returning to the welding workplace. It goes without saying that visitors should also be made aware of the presence of high electromagnetic radiation in the vicinity of welding to ensure their safety. The exposure of welders’ lungs to fume is a topic deserving of a full article. It has been covered in this publication (‘Do you know your WEL’, July 2006) . I shall not repeat the advice, other than to note that, like the hazard of noise, a risk assessment must be made and all steps taken to reduce the levels before resorting to PPE. Another, less publicised, hazard is that of ingestion of toxic material. Some arc welding processes raise the temperature of materials to their boiling point. Conditions within and immediately surrounding the arc allow many chemical reactions to take place such that the fume generated may contain compounds not in the original materials. The coarsest of the particles formed condense to create deposits alongside the weld. These are usually removed by the welder to improve visual inspection of the bead. This is typically achieved with a wire brush, followed by wiping with the gloved hand. The gloves therefore become coated and, in removing them at breaks, so do the welder’s hands. If inadequate attention is given to hand washing before smoking or eating, the deposit can be ingested. Most fluxes and metals give little cause for concern in this respect but lead, cadmium, beryllium and barium require consideration. Soldering with lead-based solders was an issue as lead can transfer easily to the hands directly from solder. This problem has now been addressed by an RoHS Directive; since July 2006, solders must be lead-free. There is also a set of regulations, ‘Control of Lead at Work’, that must be complied with if welding of lead is to be undertaken. Cadmium is present in significant proportion in some silver solders. Whilst fume generation is low during soldering, there is a possibility of cadmium and cadmium oxide deposits forming beside the joint. Beryllium is added to copper to give a strong hardening effect. Copper-beryllium alloys are used for electrodes of resistance welding machines but occasionally attempts are made to weld them. Beryllium readily forms an oxide that will deposit beside the weld. Some all-positional self shielded flux-cored wires use barium compounds to achieve good weld metal properties and positional welding capability. Deposits of barium oxide and carbonate can be formed alongside welds with these consumables. These compounds are known toxins and in such cases, extra attention should be given to the possibility of ingestion in the risk assessment carried out. The responsibility is initially on the employer to understand the dangers and to minimise them. He must then inform and train the employees to take reasonable precautions with respect to personal hygiene and the frequent replacement of overalls and gloves. The environment in which a welder works has a number of hazards that are not specific to the welding process itself. Manual handling of heavy awkward metal components is often required. Thinner, lighter metal sheet may have sharp edges. Slips, trips and falls may be more likely as welding often requires thick cables to be spread across the floor. Standard workshop safety and protection practice should be used to counter these problems. Welders need training in materials handling, both manual and with mechanical lifting assistance; protective gloves, overalls and boots must be worn; cabling on the floor should be minimised and clearly signed or marked as a trip hazard. There are, however, more hazards that are a direct result of the joining process itself. During welding, sparks and molten metal can be ejected. These are most common in arc welding but can also occur in resistance and some friction processes (e.g. linear friction welding of titanium). In mechanised processes, guards should be used to contain the flying particles. This is not possible in manual welding so the PPE worn by the operator must be capable of protecting the body. All clothing should be fire resistant and use of leather aprons, jackets, chaps, etc. is recommended. Friction welding is a mechanical process using equipment that rotates or oscillates the faying pieces. In this respect it is similar to equipment in a machine shop, except that it can be significantly larger, or in the case of micro-friction welding, smaller. The precautions required are therefore similar to those in a machine shop; the work should be screened by guards, operators should not have loose clothing, long hair, dangling jewellery, etc., but there may be specific requirement created by the size of the equipment that can only be defined by risk assessment. One of the more serious dangers is from the persistent use of vibrating hand tools: grinders, scaling hammers, pneumatic burrs, etc which can lead to long-term illness - hand-arm vibration syndrome, also known as ‘white finger’ or ‘dead hand’. The HSE publishes an RHS Inspection Pack ‘Hand-arm Vibration’ which shows that action may be required with as little as 30 minutes per day use of a chipping hammer. Once more, employers are required to carry out risk assessments to identify potential problems from vibration. The majority of welding techniques rely on electrical power. This is usually transformed from three phase 440V mains to something appropriate for the process. Any breakdown in the insulation either before or after the welding set can expose the user to the risk of electrocution. PPE, eg gloves and rubber soled boots, can mitigate the damage but should not be considered a first line of defence. A regular inspection and maintenance schedule should be in place to ensure that all wiring is to the required standard. Arc welders work with an open circuit between the electrode and the work piece. There is therefore a risk that by mishandling - touching both the electrode and the work piece - a current path could be established through the welder’s body. Whilst the welding voltage (ca 20V) is not high, the open circuit voltage can be considerably higher (80 to100V). The risk of damaging, and possibly fatal, electrocution is real. Another aspect to be considered is the return path of the current. Good, direct earth return from the work piece to the welding set is essential. It not only allows consistent parameters to be set to give optimum welding conditions for the product, but protects personnel. With an indeterminate return, the current path can track through any earthed metallic structure in the vicinity putting a wide variety of people at risk. Much of the gas used in welding and allied processes is supplied compressed in metal cylinders. Although several are inert or of low activity chemically, eg argon, helium, carbon dioxide, they pose a risk on two counts - their weight and the possibility of sudden escape of gas. Gas cylinders are heavy, gross weights can exceed 80kg, and should be manually handled minimally and with great care. When sited in a store or on the shop floor, they must be held in a purpose-built stand, restrained within it by a chain. Clearly, a tall cylinder falling is a dangerous object that can inflict considerable bodily harm. A much greater danger exists with the use of inert gases in welding, eg argon, helium, nitrogen and carbon dioxide. Argon is denser than air and accumulates at the bottom of confined spaces. Welders working in confined spaces with inert gases have died of asphyxiation. Adequate forced ventilation must be provided in such spaces and the welder should be provided with breathing apparatus providing as appropriate for the task. Where a welder may be placed at risk by working in a confined space, a risk assessment should be carried out in accordance with the Confined Spaces Regulations 1997. All equipment used in gas processes, regulators, flashback arrestors, hoses, non-return valves and blowpipes, should be regularly inspected and maintained in accordance with manufacturers recommendations. As has been commented throughout this piece, the key to creating a safe environment for welders is to anticipate potential hazards, move to minimise their levels, provide adequate protection for personnel and give comprehensive training in identifying risk and dealing with it.